Well, it said ‘West End Women’ on the tickets, so everyone knew what this concert was all about, but this didn’t stop presenter Lucy Drever from repeatedly reminding the audience who the ladies on stage were: “West! End! Women!”. Relatively few songs were introduced in their own right, however, and the running order, alas, was not made available to the said audience (leading to a slightly amusing comparison of notes between reviewers at the interval), but as ever with events of this nature, some tunes were as recognisable as others. Anyone who happened to be at the concert but didn’t know much about these actresses didn’t find out anything about them, other than their versatility, professionalism and skill in tackling a broad range of songs, mostly from musical theatre. The close of the show could have been more celebratory, perhaps drawing from the feelgood music of the likes of Mamma Mia! or one of the Disney musicals. While Celinde Schoenmaker quite sublimely reprised ‘Think of Me’, having performed in the West End production of The Phantom of the Opera in the role of Christine Daaé, I didn’t pick up on either Rachel John or Lauren Samuels singing anything from their previous roles, though there might have been a feature for a role to come – after that performance of ‘Summertime’ from the Gershwin’s Porgy and Bess, John would certainly be a fine contender to be part of a future production of that show. There was Paul and Pasek’s ‘Never Enough’ (The Greatest Showman still counts as a musical, even if it is a movie rather than a stage show), while the final number, ‘I’m A Woman’, by Jerry Leiber and Mike Stoller, is one of thirty-nine numbers that form the musical revue Smokey Joe’s Café, which played in the West End at the Prince of Wales Theatre from October 1996 to October 1998 (yes, I had to look that one up, having heard the song at various musical theatre concerts over the years but not quite being able to place it). But for a show that billed itself as featuring “three superstars signing some of the biggest and best-loved showstoppers”, as far as ‘showstoppers’ go, there were omissions galore. True, the concert could have gone on for twice as long as it did and still left certain people disappointed that their favourite ‘showstopper’ wasn’t included, but the emphasis was largely on more mellow melodies than on belters. Thus nothing like ‘And I Am Telling You I’m Not Going’ from Dreamgirls, ‘Everything’s Coming Up Roses’ from Gypsy, or Funny Girl’s ‘Don’t Rain On My Parade’. An orchestra of twelve, conducted by Adam Hoskins, added much to proceedings, as did a 60-strong choir comprising the female students of the MX Masterclass, a musical theatre performance academy set up and run by stage musical stalwart Michael Xavier. 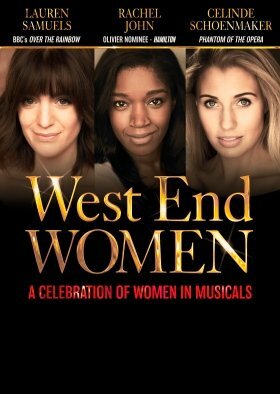 A competition to win a slot in the ‘West End Women’ concert, involving the submission of a one-minute video recording of any musical theatre song to producers Lambert Jackson Productions, had no age restriction. Talia Robens, 14 years old, gave a lovely rendering of ‘Everything I Know’ from In The Heights. Brady Isaacs Pearce, 18 years old, brought the house down with ‘A Piece of Sky’ from Yentl, the 1983 motion picture. Lauren Shields, Kayla Carter and Martha Boon, also competition winners, opened the second half (with the leading trio) for ‘Cell Block Tango’ from Kander and Ebb’s Chicago.